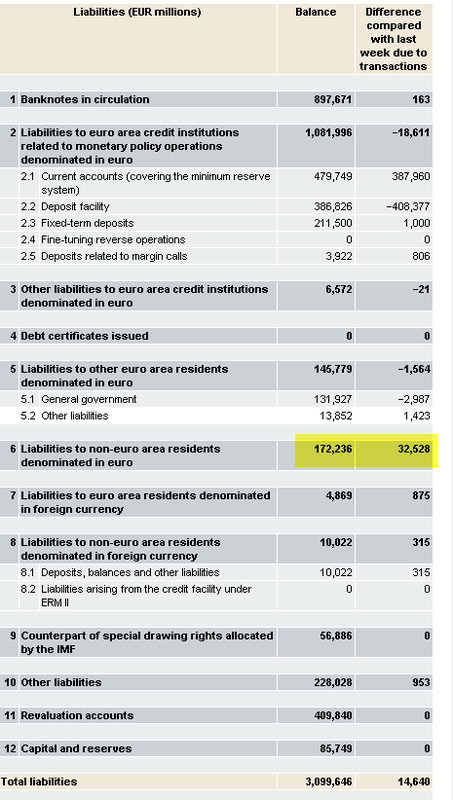 Here is a quick follow-up on the post discussing the ECB liabilities to non-Eurozone entities. Large euro deposits originating outside of the Eurozone can come from the Fed Liquidity Facility (the Fed took in euros as collateral for dollars it was lending out) or from other central banks trying to defend the euro peg. The chart below is an attempt to subtract out the Fed Liquidity Facility from the non-Eurozone deposit balances. It's not a straight forward exercise because the euro collateral does not exactly correspond to the amount of dollars lent, which is what is available on the Fed's website. The timing of the weekly reporting is also different. But the chart does give an indication of central banks other than the Fed placing euros with the ECB. There is no question (see Kostas Kalevras most recent ECB update) that the increase is driven by either Switzerland or Denmark (or both) defending the currency peg, buying euros and depositing them at the ECB. And the sellers of those euros are Eurozone's citizens trying to convert their money into other currencies. The current balance is €172bn less €24bn from the Fed's facility gives €148bn from other central banks. 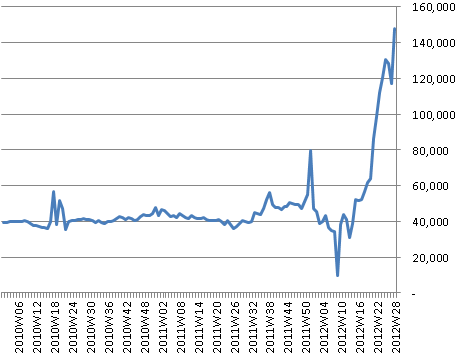 Here is the latest liability side of the ECB's balance sheet.